Tony Turner cooking dinner at his apartment in Queens Bridge Houses in Long Island City. Tony Turner knew he had to improve his eating habits to reverse a recent diagnosis of prediabetes, but, after several years in the foster care system, he did not know where to start. Turner realized he rarely received guidance on how to prepare nutritious meals or how to shop for healthy food on a budget so he decided to advocate for such programming at his foster care agency, which responded by introducing a 12-week nutrition program to address those deficits. After the program ended, he said he noticed the agency began to serve healthier meals and he perceived an overall atmosphere of health consciousness in the organization, reflected by staff and clients who continued that support-group mentality by encouraging one another to eat better. In a column in the foster youth advocacy magazine Represent, an anonymous 17-year-old writer also says she had to lobby her agency for healthy food. Skeptical staff doubted that the other residents would elect to eat lower-calorie meals at her group home, which prohibited residents from accessing the kitchen, she writes. Two months later, the group home staff finally acknowledged her advocacy and added healthy meals to the menu, which quickly became popular among the girls in the group home, she says. 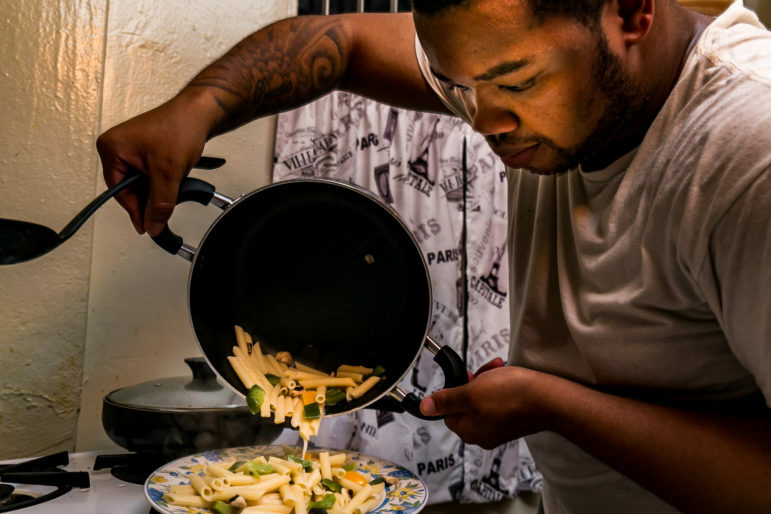 Young people in foster care – especially in group homes or in households that limit kitchen access – often lack autonomy in their meal-planning or food preparation. Though nutritious food serves as a vital preventive health resource, how and what foster youth eat typically depends on their agency’s priorities, their foster family’s commitment to their health, their access to permanent housing, their experience in school and their own initiative. New Yorkers can remain in foster care until age 21 – though they can choose to leave at any time after age 18 – and each year about 1,200 age out, according to the Administration for Children’s Services. For them, the ordinary challenges of navigating adulthood are complicated by insufficient support systems and deficits in the sort of preventive health skills – like food preparation, hygiene and understanding insurance – that individuals with consistent family members modeling such behaviors and giving advice tend to take for granted. In the absence of clear guidelines from the city and state for providing nutrition education or practical food preparation skills, individual agencies that serve young people in foster care and young adults who have aged out must determine how to incorporate – or ignore – skills like food preparation, grocery shopping and budgeting into their work. A 2014 study published in the journal Pediatrics found that individuals who grew up in the foster care system experience preventable, chronic health problems like diabetes, hypertension and asthma at a rate significantly higher than the general population, even exceeding the rate among low-income individuals who did not grow up in foster care. The study suggests the health disparities relate to emotional trauma and discontinuous care – meeting with a different pediatrician every time the young person moves to a new foster home, for example – in addition to poverty. “Most young people in the foster-care system have been through more than one difficult situation and it’s important they have supportive influences in their lives,” Dr. Kym Ahrens, a Seattle-based pediatrician and the study’s lead author, told City Limits. In the study, Ahrens and her colleagues say individual programs tailored to the needs of each individual as well as wellness training for foster parents and workers can help mediate the health disparities. While some young New Yorkers transition from foster care into special supportive housing programs and others receive priority on NYCHA waiting lists, many young adults age out of care with limited social support or housing options, increasing their risk of homelessness. Like all city-funded entities that provide food, foster-care agencies and other organizations – like supportive housing sites – that serve young people in foster care or those who have aged out must follow specific nutrition guidelines outlined by the city Department of Health. But simply securing a next meal takes precedence over its nutritional value for many young people. “I never had breakfast for a year and a half and lunch in school was not that good so I didn’t eat much lunch,” says Shatierra Freeman, a 24-year-old who participates in the Foyer Program operated by The Door at a Breaking Ground supportive housing site. The Foyer Program serves young people who have aged out of foster care but would benefit from additional education, employment and skill-building services at special supportive housing residences. Before she connected with The Door, Freeman – who is 5′ 9″ – says her weight dropped below 100 pounds. She now works as a peer ambassador for The Door, an organization that serves young people – including foster youth – aged 12 to 24. Their Broome Street headquarters features an industrial kitchen, medical clinic, a social service team and an array of arts activities. In foster care, Freeman says she stayed with six different families, of which five locked the refrigerator or prohibited access to the kitchen. She says her foster-care agency referred her to The Door and she initially stuck around for their free and varied meals. A professional chef prepares three meals a day and provides formal and informal nutrition training for young people. Freeman now serves as a peer educator, sharing information about nutrition, healthy relationships and wellness while encouraging other young people in need to visit The Door for more comprehensive services. At the New York Foundling’s DeSales Mother and Child Program in Staten Island, more than 20 girls and young women in foster care reside with their children while working or attending school. The social service team at the site provides a corrective experience and supports the young mothers still learning how to best care for themselves. Earlier this summer, when the agency nurse practitioner informed the DeSales team that a number of the residents experienced obesity and were at-risk for chronic health problems, Williams says she and her staff recruited a nutritionist to work with the head chef to revamp the menu. Residents had long complained that the healthy meals did not taste good, she says. Nutritionists and dieticians also lead cooking workshops to help the young mothers learn how to better feed themselves and their children, especially as they transition to independent living, she says. The emphasis on nutrition ties in with the work of social service staff who incorporate wellness into their counseling and coaching, she says. Successfully addressing nutrition deficits demands that sort of integrative approach, says Denise Hinds, associate executive director at Good Shepherd Services, which also operates a Foyer Program for young adults aged out of care. Social-service team members must address healthy eating and food budgeting in their work with young people beyond one-off workshops and voluntary classes. Counselors visit Foyer Program apartments weekly, look into tenants’ refrigerators and discuss food options as part of their regular work, Hinds says, but food choice usually comes down to finances.